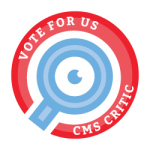 The CMS awards, hosted by CMS Critic were launched in 2012 to help spread awareness of all the content management platforms that are available. The response to last year?s inaugural awards was overwhelming. CMS Critic had to sort through thousands of votes before crowning the winners. Other categories include "Best Open Source CMS Selection" and "Best Social Networking Solution." The entire list of award categories and nominees can be viewed here. You can vote for your favorites here. The winners will be announced from November 31st to December 31st.